Small-cap growth funds are natural choices for investors with a high-risk appetite when capital appreciation over the long term takes precedence over dividend payouts. These funds focus on realizing an appreciable amount of capital growth by investing in stocks that are projected to rise in value over the long term. Meanwhile, small-cap funds are good choices for investors seeking diversification across different sectors and companies. Small-cap funds generally invest in companies having market cap lower than $2 billion. The companies, smaller in size, offer growth potential and their market capitalization may increase subsequently. Also, due to their less international exposure, small-cap funds offer higher protection than their large- and mid-cap counterparts against any global downturn. Below we share with you three top-ranked small-cap growth mutual funds. Each has earned a Zacks Mutual Fund Rank #1 (Strong Buy) and is expected to outperform its peers in the future. Bridgeway Small-Cap Growth Fund (MUTF:BRSGX) maintains a diversified portfolio by investing a large share of its assets in small-cap companies, having impressive growth prospects. BRSGX invests in companies that are listed on the NYSE, NYSE MKT and NASDAQ. Bridgeway Small-Cap Growth has one-year annualized returns of 21.9%. John N.R. Montgomery is one of the fund managers of BRSGX since 2003. Goldman Sachs Small Cap Growth Insights Fund (MUTF:GSAOX) maintains a diversified portfolio by investing a bulk of its assets in equity securities of small-cap domestic companies. Most of these small-cap companies are included on the Russell 2000 Index. Goldman Sachs Small Cap Growth Insights A has one-year annualized returns of 25.4%. As of April 2018, GSAOX held 341 issues, with 1.34% of its assets invested in E-Mini Russ 2000 Jun18 Xcme 20180615. Hartford Small Cap Growth HLS Fund (MUTF:HBSGX) invests the major portion of its assets in common stocks of small-cap companies. HBSGX looks for companies that are expected to have above-average growth prospects. The fund may also invest a maximum of 25% of its assets in non-U.S. securities. Hartford Small Cap Growth HLS IB has one-year annualized returns of 18.6%. HBSGX has an expense ratio of 0.91% compared with the category average of 1.41%. 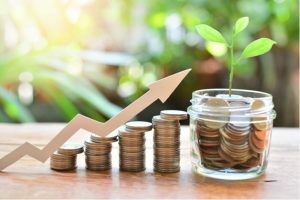 Article printed from InvestorPlace Media, https://investorplace.com/2018/08/bet-3-small-cap-growth-mutual-funds-healthy-returns-ggsyn/.